"Is this title crawl getting too long? Are we losing your interest? Is anyone out there? Hello? This is important stuff!" When Hardware Wars was released in 1977, it was unique�it was the first Star Wars parody and, though released independently, became a cult success. Throughout the buildup to the release of Phantom Menace, sci-fi parodies were again en vogue, and every nerdling with access to a computer created his own short film, from the good (Troops, The Phantom Cuticle), to the very bad (check out the downloads section of starwars.com... yeesh!). Star Warp'd is, thankfully, a member of the former category. It's not only a Star Wars parody�it also lampoons Trek, Robocop, Alien, and even E.T. : The Extra Terrestrial. It's not laugh-out-loud funny, but it's very clever, and that's good enough. 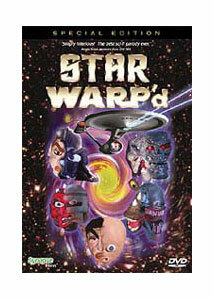 Produced independently (translation: with no money, on borrowed sets, and in the creators' spare time) by brothers John and Pete Schuermann and animator Milko Davis, Star Warp'd follows the exploits of Captain Kwirk and Mr. Speck as they face off against the evil Dark Vapor. You see, the Monolith (guarded by a foul-mouthed Star Child) has gone out of whack, and the barriers between the universes are crumbling (allowing for the appearance of characters from several famous sci-fi films to interact). It's up to the crew of the Starship Consolation Prize to repair the Monolith and restore order to the galaxy. But first they must face... the Fandom Menace! The animation is an eye-catching mix of CGI and claymation. It looks cheap, but it's also got character, particularly the stop motion from Milko Davis. The script, from John Schuermann (who also composed the score, itself a parody of many different famous sci-fi themes) isn't quite as laudable. For every gag that works (Bow-Tie Fighters, Spock's shooting spree, Darth Mini-Maul), one falls flat�particularly the villain, Dark Vapor, who controls the "Dark Side of the Smell," which means he has the power of farting. Sigh. Sci-fi fans will find a lot to like, though, despite all the bodily humor and some well worn material (how many times can we make fun of William Shatner's speech patterns?). After all, where else do you get to see Robocop face off against the Terminator? Or the Predator battle... E.T.? And the identity of the Fandom Menace (which I'll not spoil here, though it is revealed on the back of the box) is pure brilliance�and, I suspect, pure wish fulfillment for bitter Star Wars fans. Image Transfer Review: The transfer is listed on the back of the box as 1.66:1, but the letterboxing is barely noticeable on my 4:3 set�the transfer actually appears to be closer to 1.50:1. Regardless, it is nice looking, considering the program's low-budget origins. Colors are nice and saturated. The image is nice and sharp, with no print flaws or graininess visible. Some slight aliasing is visible here and there, but nothing too severe. Audio Transfer Review: The audio is serviceable, but not quite as impressive as the video. The 2.0 track confines everything to the front soundstage. Dialogue is fairly clear and never overpowered by other elements in the mix. Sound effects are presented across the left and right mains with limited directionality. The score expands the mix a bit (with slight bleeding into the surrounds), but tends to sound a bit harsh and unsupported. Extras Review: Synapse has produced a nice set of extras for this DVD. Behind the Scenes runs 12 minutes and offers an inside look at the difficulties of producing a film in your basement. Hear director Pete Schuermann discuss creating computer graphics on his Mac. See animation supervisor Milko Davis coax a good performance out of the Terminator clay model. Gasp as composer John Schuermann reveals the secrets of "honoring" classic film scores without getting sued. The Schuermann brothers are then joined by production designer Dave Carty for a jovial commentary track. It's an entertaining listen, as the three discuss the project from inception to completion, focusing on what parts they particularly like, and what they wish they could've done better. Note that throughout, they refrain from directly referencing the films they parody, to avoid any unwanted litigation. There has been a post-Phantom Menace glut of sci-fi parodies in the last couple of years, and Star Warp'd is one of the better ones. The DVD isn't bad either.